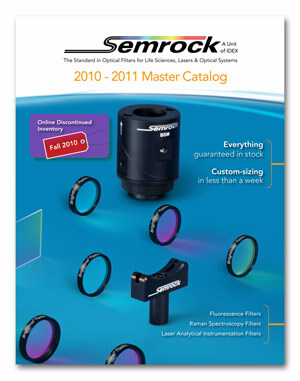 ROCHESTER, N.Y. – Semrock announced the release of its new 92-page, full-color 2010-11 Master Catalog of optical filters and related products. This comprehensive catalog contains additional Technical and Product Notes along with over 65 new filter products optimized for fluorescence, Raman spectroscopy and other laser analytical instrumentation applications. Among the standouts of this edition are the new BrightLine® GFP and FITC High Brightness & High Contrast sets. These sets widen the filter selection for additional signal or minimizing photo bleaching. In addition to our new high-brightness, high-contrast filters, our original all-purpose, high-performance sets that offer the best of both worlds are still available for imaging FITC and GFP. Also highlighted in this catalog is the world's first Penta-Sedat set for DAPI/FITC/TRITC/Cy5/Cy7. The eleven-filter set enables imaging of five distinct fluorophores simultaneously for the most complex imaging schemes. The new BrightLine Quad-band full-multiband filter set for DAPI/FITC/TRITC/CY5 was designed for simultaneous four-color imaging by eye or with a color camera using broadband illumination. New to the non-filter products section, Semrock has added an "FH1" holder designed to secure a VersaChrome™ tunable bandpass filter on a rotation stage. Exceptional Semrock services highlighted in the catalog include our same-day shipping policy, rapid custom-sizing in under a week, and a 30-day no-hassle return policy. All Semrock filters are covered under the company's five-year warranty.